Mazda Miata and RX7 are modern roadsters. The Mezda Miata remains one of the most popular roadsters in the U.S. because it is fun and affordable. Mazda improved upon the safety features and their models offered precision engineering. Each of our Mazda convertible tops is manufactured to original pattern specifications and we offer the original fabric selection. Our Mazda convertible tops will instantly renew your vehicle to show room condition. 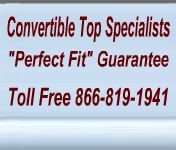 Our replacement Mazda convertible tops are available for the Mazda Miata convertible top and the Mazda RX7 convertible top.